The Mint Chicks, an experimental punk rock pop group from Auckland, New Zealand, won three awards at the 2007 Vodafone New Zealand Music Awards earlier this month. They won Nokia Album of the Year Tui with Crazy? Yes! Dumb? No!, the Steinlager Pure Best Group award and PPNZ Best Rock Album. Here’s their music video, for the single “Walking Off A Cliff Again”. 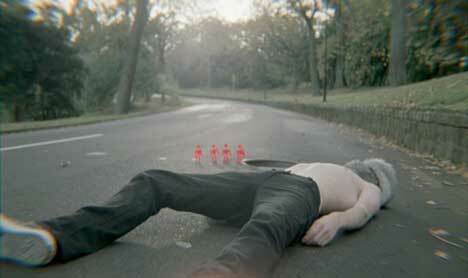 A man with rabbit ears lies on the road. He’s inspired into action by mysterious animated figures who spell the word HELP. As he runs through the country and city we’re introduced to a number of characters who appear to be paralysed by inertia, bitterness or boredom. 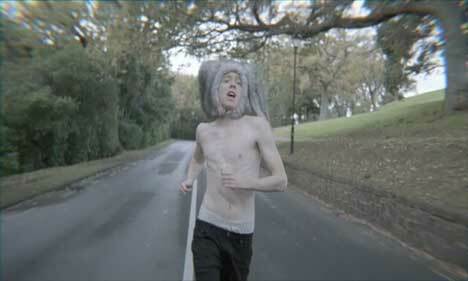 The rabbit man runs to the top of a tall building and leaps down on to the street. As he lands in a bath on the pavement his saturated ears splash life into the inert lives of those around him. walking off a cliff again!! Filming was shot by director/editor Samuel Peacocke, via Robber’s Dog Films, Auckland, with producer Kristian Eek and director of photography Ian McCarroll. Post Production was done at Perceptual Engineering, Auckland. See more at the Mint Chicks MySpace site.